How to build stamina and plan ahead for the year of the fire monkey. 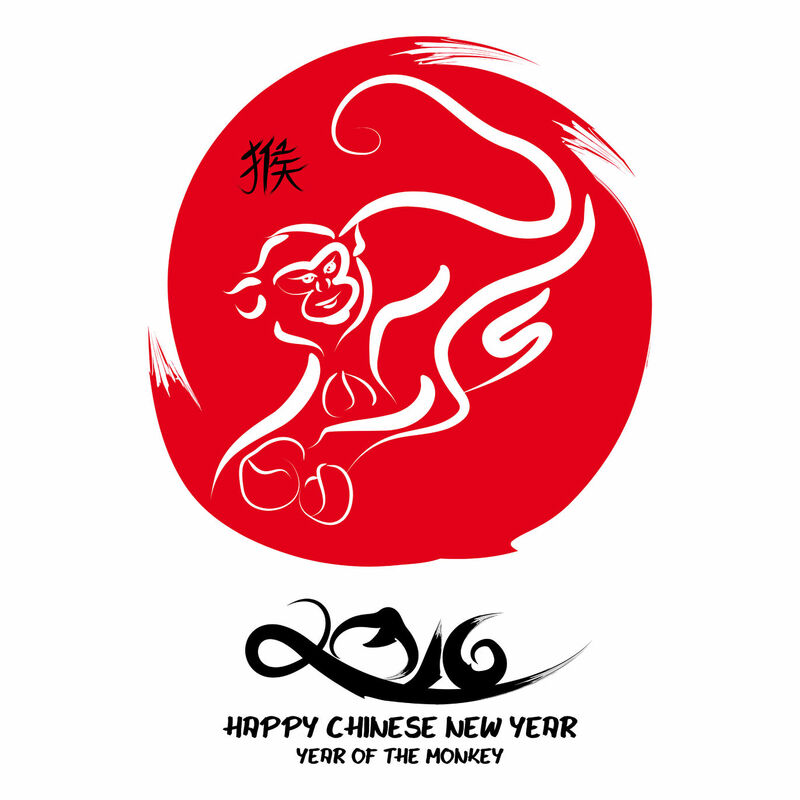 The Fire Monkey is an adventurous and high-energy animal, and that is what is in store for the Chinese New Year of 2016. The monkey is ambitious, energetic, inventive, and uninhibited. Anything can happen. Everything is in flux. Such a dynamic and active year requires diligent self-care so you don’t get burned out. This is a fire year, which means that it is a time when your plans can finally come into fruition. However, the monkey’s high, almost hyperactive energy can be reckless and hard to control. Luckily, fire improves focus, and strong focus and discipline is exactly what you will need to keep from getting sidetracked this year by the next exciting thing. Slow and steady, with great courage is the way to move forward in 2016. Pro Tip: Start using a planner to help you focus your big dreams for the year. If you haven’t already, take some time in the next week to lay out the 2-3 big goals you have for the year. Focus on both career and family/social life to promote balance. Each month, check in with those goals and see what kind of progress has been made or what kinds of set-backs have shown up. You can do this very loosely, as with a continuous document or notebook, by just listing out progress and set-backs. Each week, break your monthly goals down into bite-sized steps and build them into a planner for the week. You can make this up as you go, but it is much easier to use a guide, such as Danielle LaPorte’s Desire Map Planner or the Savor Collection’s Daily Action Planner. One of the keys to making your life what you want this year is to take a cue from the monkey and be bold. There is no room for self-doubt, insecurity, or playing small in the year of the Fire Monkey. This year is about passion and decisive, confident action. You need to be able to release negative thought patterns or this year could prove to be rough. Pro Tip: Start a meditation journey. Meditation is intimidating, but doesn’t have to be. You needn’t be able to sit quietly with an empty head moving towards nirvana in order for meditation to be beneficial. And there’s no such thing as failing at meditation. Would you believe that each time you have to pull your brain away from the thoughts that are floating through and back to your breath or a mantra you are actually making new neural connections? Monkey brain isn’t all bad! Try to focus your meditation practice on releasing your negative self-thought. You can use a mantra for focus during meditation such as “I am not my thoughts” or “I am a powerful, successful person.” These may sound silly, but oodles of research back up the power of meditation. Just try it for 10 minutes for 7 days and see the difference it makes. The monkey also likes to be a bit mischievous insofar as he is unpredictable, selfish, and a bit magical. It is thought that there will be plenty of chaos this year, and that your plans will almost never go as expected. The goal then, is to be able to go with the flow. You need to trust that out of chaos can (and usually does) come beauty and wonder as long as you are not too rigid with your expectations. Pro Tip: Focus on gratitude. Try ending each day by writing down at least one gratitude. I often meditate on my gratitude as a way to quiet my brain so I can fall asleep. Focusing on gratitude will help you realize the beauty that exists even within disappointment or chaos. It only takes about 1 minute, and you feel the benefits immediately. The monkey likes innovation and is incredibly opportunistic. Be like the monkey. Open your eyes and your mind to possibility, and be prepared to jump at a moment’s notice. The monkey is intellectual, however, so it is important to make decisions with logic more than with emotion. Pro Tip: You need to stay strong and on your toes this year. Stress will get in the way of you being open to the possibilities presented. Part of de-stressing is eating well. Try to focus on color this year. Make it a goal to eat as many different [natural] colors as is possible each day. Colorful fruits and veggies are high in anti-oxidants, which neutralize those stress-induced free radicals. Red cabbage, yellow peppers, orange carrots, and green onions are all making an appearance in our dinner tonight (loosely based on this recipe: http://theurbanposer.com/once-upon-time/ — I omit the fish sauce and add a few tablespoons of Bragg’s Amino Acids). Strong roots in earth and water will help to balance this fire year. This means avoiding foods that are greasy and rich, as they will create more heat within your body. You should also try to practice a go-with-the-flow type of water-y exercise, such as yoga, tai-chi, swimming, or dance. These will help you ease stress while also building a good base to balance any out of control fire. Pro Tip: Try yin yoga. It is a slow-paced yoga style that is about deeply relaxing and stretching into poses. It gathers your yin energy, so is a good balance to the high Yang energy of the year. It is a great way to relax, and is an incredible compliment to your muscles if you do any high intensity cardio. Doing this type of yoga once/week in the upcoming year will greatly balance you and strengthen you for the intensity of the year ahead. Of course, as usual, acupuncture is here to help calm that monkey mind that’s keeping you from sleeping, quell the anxiety that comes with charging ahead with your goals (and with being side-tracked), and keeps your muscles and joints smooth and loose so you can maintain healthy exercise rituals. So if you haven’t tried it yet, and you feel like trying to take on the balance and health required for this fire monkey year is too much to tackle alone, schedule your free consult for acupuncture now.